This is really interesting because until now the algorithm’s inner workings have been kept a closely guarded secret. The “Why am I seeing this post?” button will soon appear on all News Feed content, accessible via the top-right drop down menu. 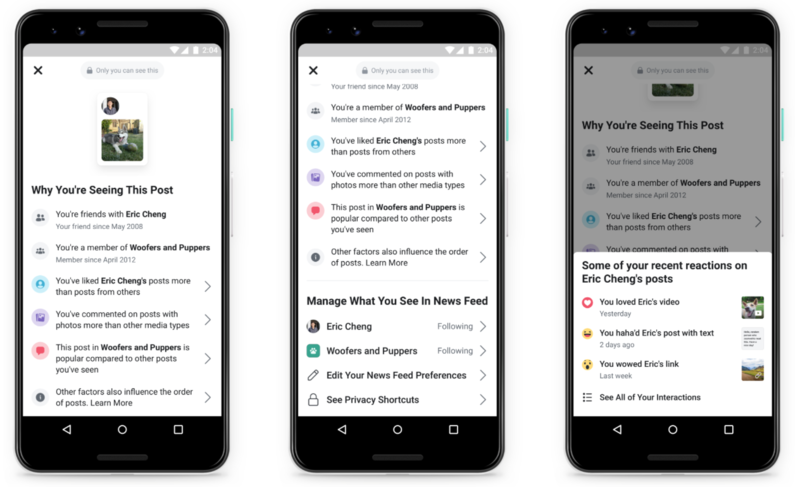 It will make valuable reading for users bothered enough to investigate (not convinced this will be a large group), who will see a list of factors behind the algorithm’s delivery of each piece of content. But the tool does more than just explain. It also helps users control their Facebook experience through shortcuts to preference selections like “See More” and “Unfollow”. The “Why am I seeing this post?” feature is a very close relative of the “Why am I seeing this ad?” button – something you might have heard a lot of talk about recently. What many don’t realise is this one has actually been knocking about since 2014. The reason it’s a hot topic again right now is because, in light of the (many) data controversies of late, Facebook has been updating it. When users click on the button, they now see much more information related to how an ad found its way to their screen. This includes when the advertiser uploaded the user’s information and if they worked with another marketing partner to run the ad. Now’s a great time to make sure you’ve got all the right permissions in place for things like custom audiences. 2. How much could possibly happen online in 60 seconds? What kind of things do you do online in the space of a minute? Reply to a quick email? Arrange a meeting? Watch a video of a cat falling off a table? Alone, these don’t sound like much. But get ready, because scaled up, the sheer volume of online activity every 60 seconds is phenomenal. Take a look for yourself below. 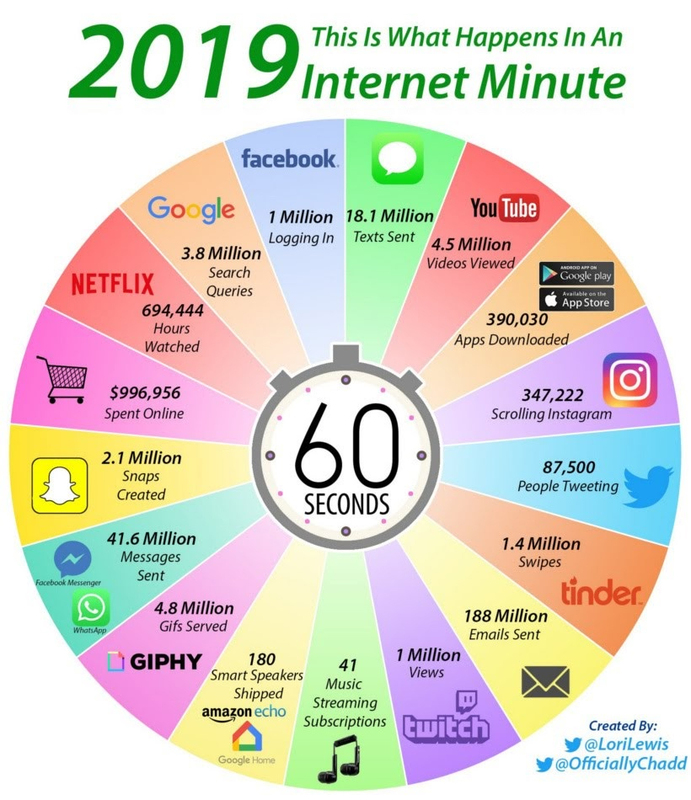 This cool infographic from Lori Lewis and Chadd Callahan has just been updated for 2019 and now includes up-to-the-minute stats for the all the major social platforms. I’d be keen to know for sure if the total online spend figure is global or US only given it’s presented in $. It would also be great to see some of the same action categories across different platforms to compare. 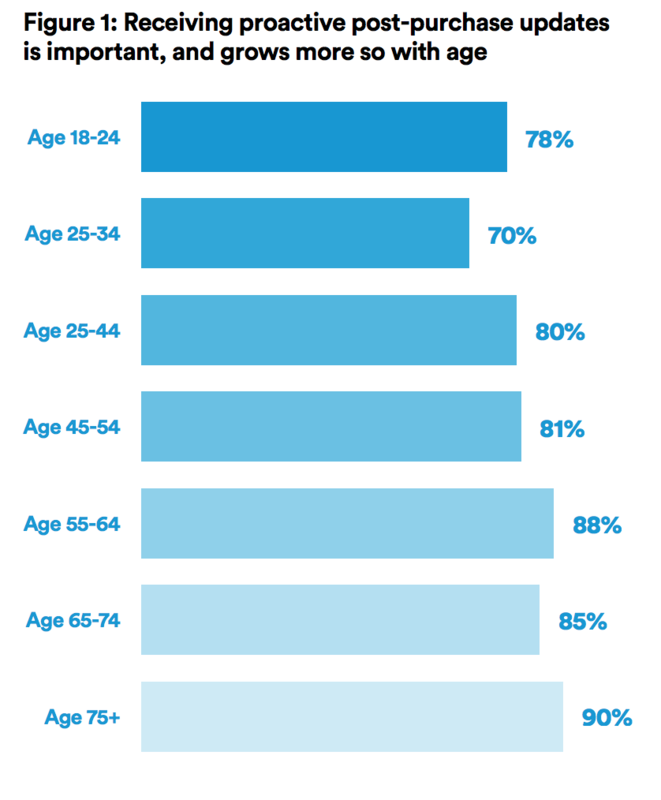 But all in all, these stats just go to show the power of digital… if you ever doubted it in the first place. When you consider Amazon accounts for half of US ecom sales, what I’m about to tell you isn’t really that surprising. A recent study of 4,500 consumers from Episerver found 87% of online shoppers compare what they find on a brand or retailer’s site to Amazon. In fact, 24% stated this is something they always do and 44% said they do it often. 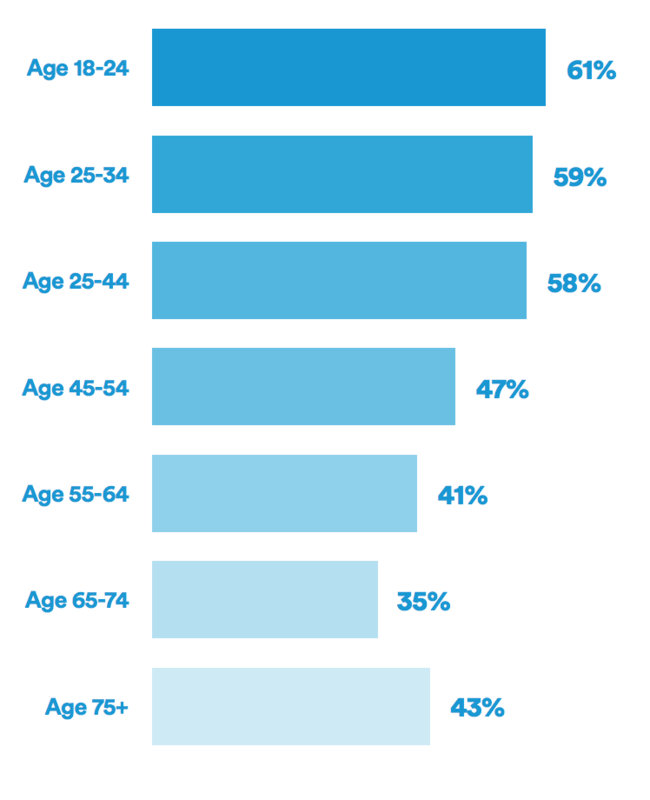 While this is a relatively small-scale study, it’s a powerful reminder of what retailers are up against with Amazon as a competitor. I also think we need to factor offline shoppers into the mix. I see it – and do it – all the time: a sly-but-speedy check of Amazon before you hand over your money in store. Just to be sure you’re not getting ripped off. As you might have already gathered from the first story in this week’s roundup, Facebook is pushing hard to repair its reputation by making advertising more transparent. Another major way this will be achieved is through the Ad Library (previously called Ad Archive in the US). Ad Library was initially launched to help people learn more about political ads that have run on Facebook or Instagram (for obvious reasons). Now it’s opening up to include all ads run by all Pages, meaning you’ll be able to see active ads any page is currently running on either platform. I’ve seen conflicting reports about whether expired ads will also be visible but it would be great if they were. 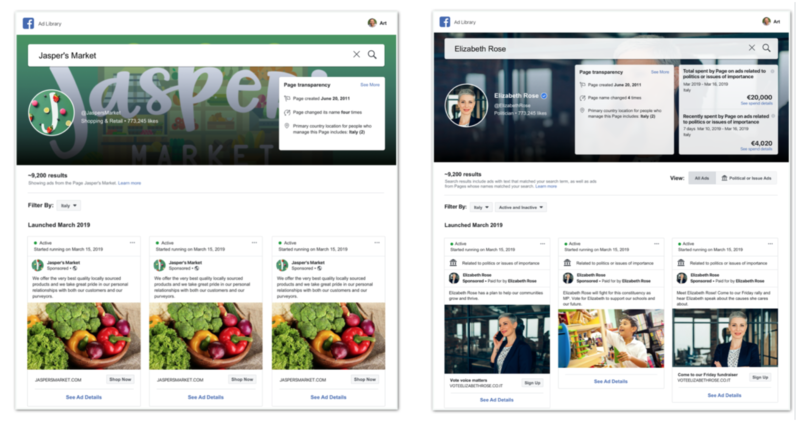 Of course, you can already see live ads from a brand via the “Info & Ads” tab within Pages – but this will bring everything together in one place. From a marketers perspective this is gold for one main reason: spying. You’ll be able to do some pretty in-depth investigations into competitor’s activity, even down to whether they’ve begun advertising in a new region. It doesn’t look like the update has rolled out to the UK yet, but we’ll be jumping right in as soon as it does. There’s something else you should make note of too. The Home section of Pages is being refreshed to include a “Page Transparency” section within “Page Information”. This will feature a lot of the same additional information from Ads Library. All marketers (should) know they have to woo people pre-purchase. It’s well known that initial relationship cultivation is key to whether or not someone moves through your sales funnel in the desired direction. But what about post-sale interactions? Are you doing enough to nurture your customers once they’ve made the commitment you’ve been chasing, and foster what will ultimately become brand loyalty? And what do modern customers expect from you anyway? A new survey of 2,000 UK shoppers by Narvar has revealed some valuable insights into the “post-purchase hierarchy of needs”. If you have time, read that last point a few times over, and keep it front of mind when strategising for the year ahead.